Roku is the simplest way to stream to your TV with over 2,000 streaming channels. Roku lets you be the master of their entertainment universe granting them access to more than 250,000 movies and TV episodes (from channels like Netflix, Hulu Plus, HBO GO, Amazon Instant Video, SHOWTIME ANYTIME, Watch Disney, PBS, etc. ), the most sports channels of any streaming platform, and fun favorite channels for any interest including Sesame Street, YouTube, DailyBurn, GoPro, Pandora, Sling TV and more. Even with this much selection, integrated Roku Search® makes it a snap to find your favorite content and discover new favorites. Choose between the tiniest Roku Streaming Stick ($49.99), the new flagship Roku 3 ($99.99), which now includes voice search in addition to an enhanced remote with a built-in headphone jack for private listening and motion-control for casual gaming, or select a Roku TV (starting at $229) includes 5 partners- TCL, Hisense, Insignia, Sharp, and Haier- and gives you Roku’s simple, intuitive interface the moment you power on your TV. Back to school is right around the corner and Parrot offers a variety of must-have products for everyone from the chauffeur, the college-bound scholar and the after school adventurer. People are increasingly using their tablets in bed, on a couch, and a variety of locations. The Tablift lets them use it in traditionally hard to use situations. This cool device allows you to use your tablet handsfree, in the places you want to use it most – like cozying up on your favorite sofa for a great movie. There’s no need to use your hands, so go ahead and dig in to some delicious popcorn without worrying about greasing up your tablet. 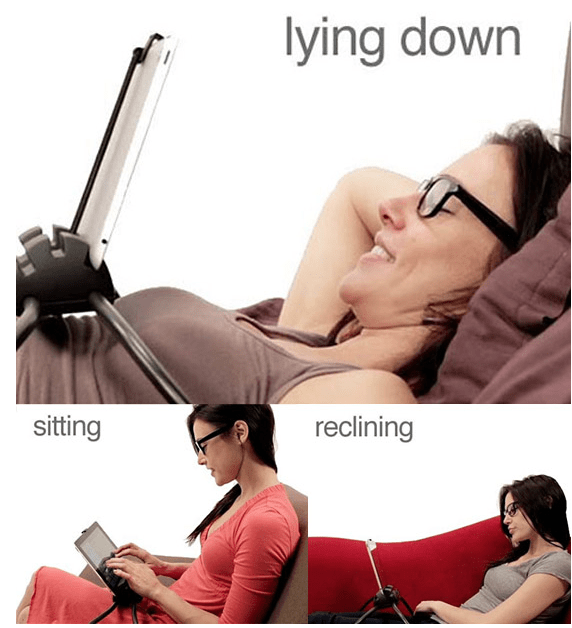 It also adjusts to three positions, making it ideal for a video chat. So now students can talk to mom and dad and slouch over the tablet! Just sit back and have a natural conversation. The Tablift will accommodate any tablet with an edge that will fit within the 10mm wide slots. For more details, visit their website at www.tablift.com. Another product we love is the V.ALRT by VSN Mobil, a new device that makes it easy to send out urgent calls, text messages, and location information at the press of a button, summoning help wherever and whenever someone should need it. The V.ALRT is a small wearable device that can be carried discreetly in a pocket or bag, worn on the wrist with the included band, or around the neck as a pendant. With V.ALRT, users that become injured, witness suspicious individuals/unusual behavior, or who find themselves in a dangerous situation can simply press the button to call for help. Using Bluetooth SMART (4.0 LE) technology along with a mobile applications provided by VSN Mobile (Android and iOS), the V.ALRT connects with the user’s smartphone and sends personalized text messages, phone calls, or location information (with GPS on) to three pre-selected contacts indicating help is needed. V.ALRT provides up to a year of use on a single battery and is available for purchase at www.VSNMobil.com and Amazon.com for $59.99, with no monthly or service fees of any kind. Jam Audio recently launched these four devices on their BTS campaign this past summer. The Jam Rewind is a must-have gift for students who are heading back to the dorms. For example, aunts and uncles who don’t know what to buy their all-of-a-sudden 18 year old niece or nephew for college, this Bluetooth pocket speaker resembles a vintage cassette tape like back in the day but with optimal sound and a fun, playful presence. For $99.99 the Rewind features four speakers and a battery life up to 8 hours. With pairing voice prompts and speakerphone, the portable speaker allows students to move from their music to phone calls so their blast never ends. Every student needs a pair of stylish headphones for all of those study sessions! These headphones add another layer of fashion to any outfit and function as a standalone accessory, in additional to being super functional and having great sound quality. Available in several styles (and with various colorways/finishes and interchangeable headphone caps to suite your every mood), FRENDS headphones feature a slimmer silhouette for a more comfortable fit, a three button volume mic, phone control, a fabric-covered cord, memory foam ear cushions and a collapsible design for easy transport. Lower-profile (yet still stunning) earbuds are also available. The “Taylor” style in particular is over-the-ear, so it definitely helps to block out some of the outside noise when you’re trying to focus while studying or paper-writing (http://shop.nordstrom.com/s/frends-taylor-headphones/3490207). Prices range from $99 to $250 – FRENDS headphones are available at www.wearefrends.com and Nordstrom/Nordstrom.com, among other retailers. 128GB Ultra microSDXC card<http://www.sandisk.com/goto/newmicrosd128/>– The world’s largest-capacity mobile memory card is designed to allow consumers to use their phones or tablets the way they would if storage limitations were never a concern. The 128GB capacity is a 1,000X increase over the largest cards available when the microSD standard launched less than a decade ago. With this amount of storage, a user could keep 16 hours of Full HD video, 7,500 songs, 3,200 photos and more than 125 apps all on a single card smaller than the size of a fingernail. The card is available to order now at an MSRP of $199.99. Ultra Dual USB Drive<http://www.sandisk.com/products/usb/dualdrive/> – A small USB flash drive featuring both a micro-USB and a USB 2.0 connector, designed for Android smartphone and tablet users who need an easy way to move content such as photos and videos from their mobile devices. The SanDisk Ultra Dual USB Drive is available worldwide in 16GB to 64GB capacities carrying MSRPs of $19.99 to $49.99. SanDisk Connect Wireless Flash Drive <http://www.sandisk.com/products/wireless/flash-drive/> – The smallest wireless USB storage device available to date, providing a convenient and affordable way to wirelessly store, share and stream content across mobile devices and computers. The drive allows users to enjoy extra storage for their devices, and simultaneously access photos, movies, music and documents on their drive from multiple devices without the need for an Internet connection or cables. The drive comes in 16GB, 32GB and 64GB capacities for $49.99, $59.99 and $99.99 respectively. 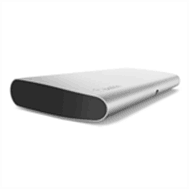 SanDisk Connect Wireless Media Drive<http://www.sandisk.com/products/wireless/media-drive/> – A pocket-sized device designed for convenience and portability, with an SDHC/SDXC memory card slot, which allows users to easily expand it for additional storage. It’s the perfect companion for travelers and parents who need entertainment on the go, providing up to eight hours of continuous HD streaming on a single charge. The drive comes in 32GB and 64GB capacities for $79.99 and $119.99 respectively. With the increasing popularity of tablets and e-readers, college students on campuses everywhere can be seen using their tablet in class to take notes, study in the library or just browse the web while hanging out in their dorm room. Octa’s Monkey Kit offers as a versatile tablet accessory for college students. It is designed to allow users to stand, grip, wrap and hang their tablet anywhere and in any way possible, making it the ideal tablet accessory for use in class, while in bed or on the couch or in the library. As a universal tablet stand that enhances the tablet user experience, the Monkey Kit lets users position tablets in various typing and viewing angles in order to minimize carpal tunnel and neck strain from frequent tablet use. Jackery is the new external battery that allows people to fully charge their phones (android, iPhone, windows, blackberry…) and tablets on the go. The Jackery charger is lightweight, fast charging, small in size and has a sleek design. The battery has up to 110 hours extra operation time. The Jackery is Amazon’s #1 provider of premium portable batteries and comes in a variety of sizes including the Mini, Bar, Giant, Air (the world’s thinnest external battery) and the newly launched Leaf, Jackery’s first snap-on battery case (image on the right). It’s the perfect gift for the Dad who loves gadgets and is always on the go! Eyefi Mobi, a wifi enabled memory card, should be on the radar of every grad and dad. Capture those walks across the stage and all the adventures new grads take afterward and wirelessly transferring them to your smartphone, tablet, or desktop with the Eyefi Mobi. By backing up your photos directly to the cloud, it’s easy to keep albums organized, tag photos, and share favorites with friends and family on Facebook, Instagram, and more. Best part? Eyefi cards range in price from $50-$100, a dime in the bucket compared to new wifi-enabled cameras out there. How about a very cool product for the photographer (tech) dad of the family – as well as for recent grads who enjoy photography? Taking indoor photos with a Nikon, Canon or something similar is very tricky — red eye, harsh shadows, that unflattering deer-in-headlights direct light from the camera’s pop-up flash — it’s even known to make newborns and babies cry! Lightscoop products offer you no-tears photography. You just slip it onto your camera’s hot shoe and it bounces the light from the flash up to the ceiling or wall just like pros do with their expensive strobes. The result? Your indoor photos look as nice as your outdoor photos. The Lightscoop Deluxe is $36.95 and the Lightscoop Jr. for advanced compact cameras is $18.95, available on the Lightscoop website. This year, stray from traditional Father’s Day gifts and treat dad to a new kind of accessory – a SANUS® TV wall mount. Offering a complete range of high-quality mounts, including full motion, fixed position and tilting, SANUS, the #1 best selling TV mount brand in the United States, will elevate dad’s entertainment experience and transform his man cave. This Father’s Day, enter the SANUS Father’s Day Sweepstakes for a chance to win the ultimate gift for dad. Four lucky winners will receive a VIZIO 32″ E-Series Smart HDTV and a SANUS Premium Series VSF415 Full Motion Mount ($410 value) to give dad on his big day. From May 19 through June 12 simply “like” the SANUS Facebook page and agree to the official rules for a chance to win the ultimate media makeover for dad. Winners will be selected at random every Friday during the promotion period. SANUS’ sleek mounting solutions are engineered with top industry technologies and tested to UL2442 standards, guaranteeing both style and safety. SANUS mounts are available at Best Buy, Costco, Target and Walmart stores, as well as local audio and video retailers nationwide. 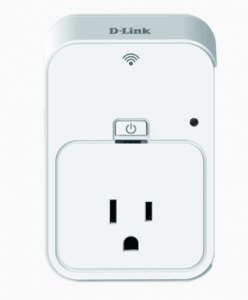 The Wi-Fi Smart Plug (DSP-W215) and free mydlink Smart Plug mobile app enable users to control and monitor their home’s electronic devices from anywhere, anytime. It also has advanced power and scheduling features, which allow users to set power on/off schedules, turn devices on and off remotely and monitor energy usage at home or on-the-go. In addition, it is equipped with a built-in thermal sensor that will automatically shut off connected devices if they overheat. Engineered to deliver best-in-class networking performance, the Linksys WRT1900AC Dual Band Gigabit Wi-Fi Router delivers an unmatched user experience and ultimate Wi-Fi coverage for your home. 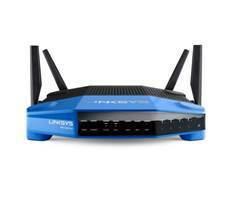 We’ve upgraded the iconic Linksys blue-and-black design and outfitted the router with the latest Wireless-AC platform along with the industry’s first four antenna configuration with a powerful 1.2 GHz dual-core ARM to provide exceptional signal strength and range to simultaneously support multiple users. We also added a unique dual eSATA/USB 2.0 and a USB 3.0 port to the Linksys WRT1900AC to conveniently connect an array of devices and experience lightning-fast transfer speeds.The WRT1900AC features exclusive SMART Wi-Fi software to monitor and control your network anywhere and anytime. It’s our first router to offer the Network Map smart tool, providing an intuitive at-a-glance view of your entire network. For advanced users who want to customize their firmware, the WRT1900AC stays true to its lineage by offering an Open WRT compatible firmware with Open Source ready capabilities that allow advanced users to expand the capabilities of the Router. The Belkin Thunderbolt™ Express Dock is an easy, powerful way to take advantage of Thunderbolt™ technology. The Thunderbolt™ Express Dock lets you use a single connection to create high-speed, reliable transfers between your laptop and up to eight other devices, including FireWire, Ethernet, USB, and daisy chaining multiple Thunderbolt™ devices. So taking your laptop when you go, and bringing it home when you return means connecting with only one cable. nio Tag, which prevents the loss of your smartphone and other valuables. As the first Bluetooth-powered security tag, you simply attach the nio Tag to any item you want to keep track of while out and about (i.e., purse, luggage, laptop case, child, etc.) or you can carry the nio Tag to secure a smartphone or iPad. Should you become separated from the item, an alarm will alert you – acting as a buddy system or an invisible, electronic leash. Headphones and earbuds: Never miss a beat with these two new earphone products, perfect for music lovers on the go. Ability to wirelessly listen to your favorite music while traveling, working out, or on the go. Collapsible for easy transportation and has Bluetooth version 4.0 to sync with your iPod® iPhone®, Android phone, or other media device that uses Bluetooth. The earpieces are composed of 2 woofers (50mm 32O) and 6 3D speakers (13mm 16O). The headphones are rechargeable via Micro USB, and have a built-in 650mAh battery to provide up to 25 hours of playtime when using Bluetooth. An inline active noise reduction (ANR) module, which helps eliminate up to 99% of external noise. A second inline module that functions as an inline control for the music player. This allows convenient control of the volume, pause/resume playback, and to skip tracks forward or backward on Apple iPod and iPhone devices, while Android devices are limited to the pause/resume playback function. Use the inline control to answer and drop incoming phone calls with a single press of the center button on the inline control module for both Apple and Android devices. 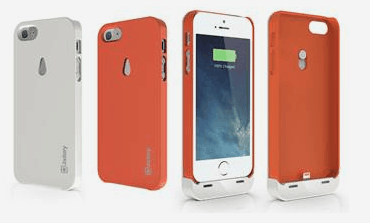 Mobile chargers: Give your iPhone®, Android smartphone, or other USB device a charge with these Battery Backup and LED Flashlight chargers. Battery Backup and LED Flashlight for iPhone®, iPod®, and other USB Mobile Devices ($24.31, #10575) — This sleek battery backup appears as slim as an iPhone and features a 3500mAh capacity, which is enough to charge a smartphone from a dead battery to full at least once.The battery also features an LED flashlight so you can insert your keys in the door lock without fumbling around in the dark. Battery Backup and LED Flashlight for iPhone®, iPod®, and other USB Mobile Devices ($29.20, #10577) — This battery backup features a 5200mAh capacity, which is enough to fully charge an iPhone at least two times. Just plug your charging cable into the battery and it starts charging automatically. It has a maximum charge output of 1.5A. The battery also features an LED flashlight for use. Mobile Audio: Take your tunes with you wherever you go with these new speakers. A 3 watts/channel stereo amplifier powering a pair of 4-ohm rated, 40mm drivers, which produce striking loudness and clarity for its compact dimensions. A built-in 1200mAh rechargeable battery, which can provide up to 10 hours of music playback. This speaker complies with the Bluetooth 2.1 specification, with the A2DP and HFP profiles. It features a Near Field Communications capability, which allows you to pair the speaker to your phone simply by touching your phone to the speaker handle. The A2DP profile allows you to control the volume and to skip tracks from the speaker controls and the HFP profile allows you to use the speaker, with its built-in microphone, as a hands-free communication device. The Bluetooth connection has a range of up to 32 feet (10 meters).